Enmin Electromagnetic Vibratory Feeders utilise the power of magnetic forces to generate energy to the conveying tray of the Vibratory Feeder. The cyclic operation is simply controlled from a range of electronic devices that will vary the feeding rate in a manner to suit the specific duty. 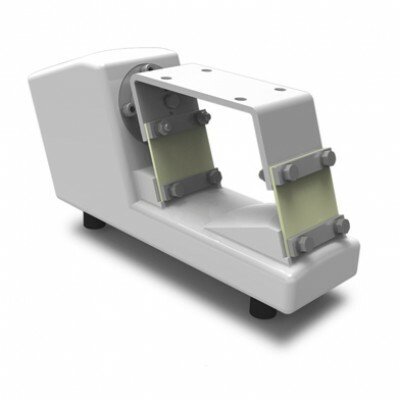 Construction of each Enmin Electromagnetic Feeder incorporates an accurately machined cast iron base, flexures and drive top and the electromagnetic assembly. Accuracy of design and attention to the quality assurance program results in the repeatability of the product being relied upon particularly where multiple drives are required. Enmin Electromagnetic Vibratory Feeders have been designed to meet the high standards of the food industry, where operation is often 24/7, requiring stringent hygiene standards, durability, efficiency and the flexibility of accepting trays of various lengths and shapes. Within other industries the Enmin Electromagnetic Vibratory Feeder is equally at home. Is the smallest model we offer and is ideally used in sampling or laboratory operations. The LD1 has also been very successfully employed as a fine dribble feeder in weighing operation where final accuracy of a product count or weight is needed. As this feeder has a very small stroke it can be controlled to deliver minute rates. Is perhaps the most versatile of our models and offers surprisingly high throughput rates. As a production type Vibratory Feeder, it will satisfy numerous applications from dosing, metering, bulk delivery to weighing and counting stations. It has been successfully incorporated into long vibratory feeders including 90 degree bends. Is the most versatile drive able to perform tasks often found with much larger designs. Among the many applications are cross feeders for multi head weighing machines, longer vibratory conveyors and systems, multi lane tracking and dividing, screening and de-dusting. Fill out the contact form below in full and we’ll endeavour to get back to you as soon as possible. Sanwest Pty Ltd was established in 1987 when the Equipment Division of Mitchell Cotts Engineering was sold to the then Manager Mr Ken Hollick. With other existing personnel who had a long association with Australian industry, the new company was established to continue marketing the products to the Australian mining and process industries.